Your first game, Adventureland, is often said to be inspired by the original Crowther and Woods Adventure. How did you first come to play that game and what inspired you to create and publish your own for home computers? I was working as a programmer at Stromberg Carlson in Lake Mary Florida. We had a DEC mainframe and the IT dept got a copy of Adventure. I heard about it and asked if I could try it out. I came in for a week early before work and stayed late after work. I had a blast playing it and it gave me the inspiration to try and create something like it on my TRS-80 Model I computer. Can you describe the development processes that you used when creating your Scott Adams games? When playing the Hulk, we noticed that there is a scene where the Chief Examiner is programming Questprobe #2… without a computer. How much of the creation process was really “pen and paper”? 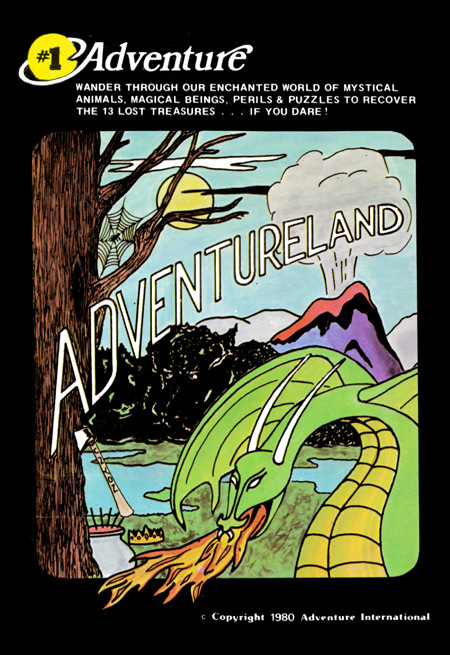 History’s first personal computer adventure game, Adventureland (1978). The games were written in my own language I developed. If you look on the web you will find fan created versions of it called ScottFree. I would do my original work on paper and then enter it into my editor. After the first go around I would print out the game and then update it on the print out and then enter it in. By 1982, you started to re-release your earlier games with graphics under the “S.A.G.A.” banner. Was this a response to Sierra (then “On-Line Systems”) use of the “Adventure” brand in their “Hi-Res Adventure” series? Was there any hard feelings there? I figured I would need to keep up or get left behind. Graphic adventurers were being requested by fans when we went to trade fairs so it was the next logical step. All my games though started as text only and then had graphics added as they made sense. What was it like transitioning from pure text adventures to graphical text adventures? How much of the art was your own and did you have the opportunity to work with many talented artists? I had zero graphical ability and hired in house an artist Kem McNair. I also used some outside artist from Adventure Graphics. This was a company that basically started at the same time I did with Adventure International and handled all our printing needs. One of our readers read once that you often sold more hint books than games; Al Lowe had the same experience with his Leisure Suit Larry hint books. Did piracy make your games unprofitable, and/or did you accept that the pirates were never really part of your market? Piracy was indeed an issue. The games that really sold the most were the ones released on cartridges for the TI-99/4 and the Vic-20. No other medium sold as well. But for whatever reason people would still buy the hint sheets and books. Although Marvel wasn't as big as what it is today, it was still a very established entertainment brand name. How did you feel when you became the creative lead of games for such a recognized franchise? Did you pitch the series to Marvel or did they come to you? Joe Calamari who was vice president of Marvel approached me. 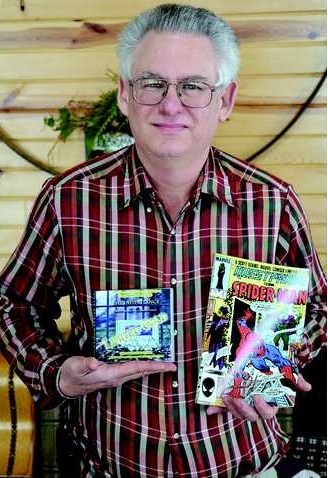 He was determined to extend the Marvel brand to home computers and his research told him to come to Adventure International. It was an incredible privilege to be able work with the team at Marvel. Jim Shooter was editor and I got to meet the entire in house team at their Manhattan offices. I visited there a number of times over the life of the project. How did you (or Marvel) decide what characters to use for each game, heroes and villains? Were you a comic book fan yourself? 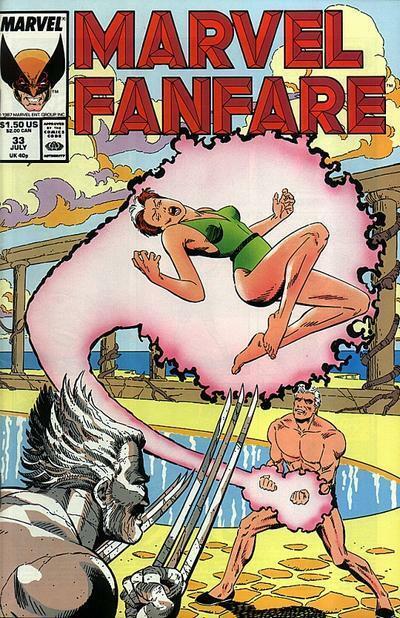 Marvel Universe #1, published January 1983. 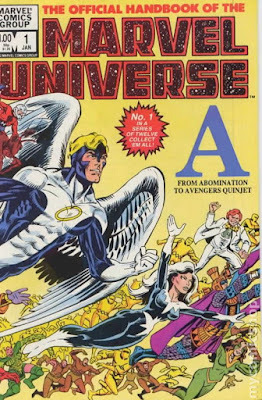 Marvel was about to introduce the Marvel Universe comic books that is an encyclopedia of all their characters. I asked them for a pre-release version and used it for my research. I also asked for and got a full subscription to every single comic Marvel produced to be mailed to me every month. I read every single one that came in and it was great. What were your expectations for the Questprobe games and were you satisfied with the results? I picked Hulk as my starting hero and Joe and Jim both asked me why I didn’t pick Spidey. My response was I didn’t think my first game would be as good as my later efforts and I want to experiment with the Hulk. I am glad I did as each game I felt was better than the previous ones. The games were seriously tough for preteens and/or people who were not exposed to the comic book characters. (Case in point: Turning into Hulk by smashing my head on the ground? Having to request Spidey specifically to use his Spider Strength to open an elevator door?) Who was your target audience? Target audience was Marvel fans. If you view the comics of that time you will find the editorials by Jim in the books talking about the games as well as ads for them as they came out. If the series had continued, did you have plans for what heroes would subsequently appear in the series? Can you shed any light on what the “master plan” was for the series and how it would have come together? My 4th project was X-Men and I did not have a preset series of characters for later books. I also had not totally firmed up the final storyline. Each game would give a password when you finished it and to play the final adventure you would have needed all the passwords from the previous games. We know that Adventure International ended in 1985. Can you shed any light on what led to the shut-down? Basically the collapse in the home computer industry. Ti 99/4a that were $1,100 at release were selling for $50. Lots of companies went under. We were totally self financed and did not have the deep investor pockets to weather the recession in the industry. In the late 1980s, you did some work for Starsoft, with credits on Pirates of the Barbary Coast (1986), Black Monday (1987), Stock Market: the Game (1987), and of course Psycho (1988). What brought you back to the games industry? What was your involvement in those games? And what have you been up to since then? Psycho (1988). A “fan favorite”. These were originally written by previous employees of mine that started their own company after AI. They asked me to do the conversions to other platforms and I helped them out. Both have since passed away. I did a remake of Return to Pirate Island around 2000 and then updated my engine to do The Inheritance a few years ago. Lot of fun doing it and I am now considering redoing The Inheritance to be more new player friendly and perhaps continuing the series. I also work full time as a staff engineer for Esterline in Platteville Wisconsin. Psycho (1988) is a game that this blog and its readers “love to hate”. Do you have any stories you can share from its development? Sorry I had even forget I had done that conversion until you mentioned it. My role was just to get it to work on other platforms and I really don’t remember much of it. Other that I have never watched the movie myself. Which game that you made was your own favorite and why? What about your favorite games made by someone else? 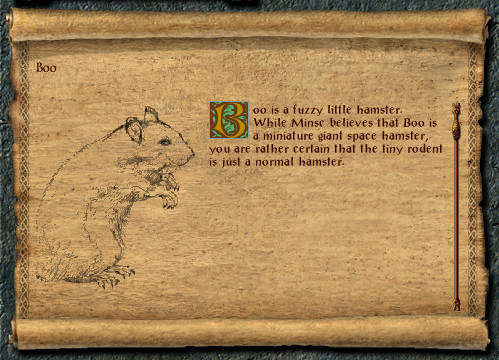 Boo from Baldur’s Gate (1998). Good text adventures have a large amount of choices and story paths; equivalent to writing several stories instead of one; where do you get your inspirations from to handle such a huge task? I like to set up locations and a goals and then start filling in puzzles, then I beta test a lot and see what routes people start trying and then that will further inspire me to other additions. Have you played the 1990s Sierra and LucasArts adventure games (including Hero's Quest / Quest for Glory)? Do you have any general or specific critiques of any of them? How would you have improved them? You emerged from “retirement” to produce “Return to Pirate’s Island 2” in 2000 and “The Inheritance” in 2013. What was your experience producing these games in a different era from your previous works? Do you have any new games planned? Retail cover for The Inheritance (2013). I recently cleaned up my engine so I can begin a port to other systems, I also want to continue the Inheritance series. I will be entering real retirement in about 3 years and then I am hoping to have more time to write new games. The Inheritance did not sell many copies and that sort of slowed me down. If folks want to encourage me to do so in emails I would appreciate it. Any comments on The Inheritance good or bad will be welcome as I mentioned I want to start redoing it to make it easier for new players. As always folks can reach me at msadams@msadams.com I always answer all fan mail and if you don’t get an answer then please resend it! Oh I almost forgot, I will be donating my early collection of games and mementos to the Strong Museum of Play in Rochester NY. What a fantastic museum! Can you tell us a bit about your background and how you came to do the art for the Questprobe series back in the 80s? I was a “hand drawn on film” T-shirt artist in New Smyrna Beach Florida at the time and had a Atari 800 computer. I had gotten interested in programming and wrote a Guitar teaching program called “Guitari”. Well I was having some problem with the code and called Adventure International in Longwood (Orlando) Fl and asked if anyone could help me and they said yes, bring it on over. Well I did. When the guy loaded it up and played the beginning splash screen with music, he flipped out and said stay right here, I’ll be right back. Well he came back in a few minutes with about 6 or 8 people and said play that intro again. I did and they all freaked out and said that is amazing and offered me a job. It was just an Atari keyboard/computer with a guitar neck sticking out of it and rainbow cycling colors on the monitor with Guitari on the screen. But they really liked it and asked If I could do the graphics for the games? I said yes and they put me to the test with some other guy, but I smoked him and the job was mine. It was a wonderful place to work and they paid me quite well compared to T-shirt art so I was a happy camper. Can you describe a bit of the collaboration process on the art for the games? How did digital art “happen” in 1984-1986? Perhaps with one like this. Well, it was very primitive that’s for sure. 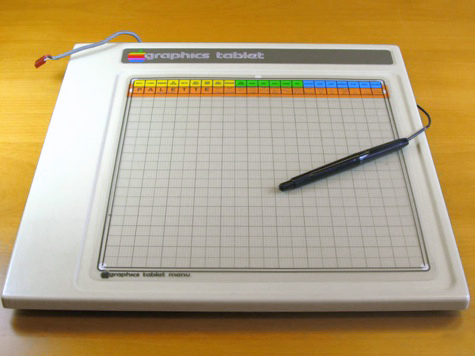 I was using a Apple II with a graphics tablet and all the graphics software was written in house by the programmers. If I needed a tool to draw circles, I would take my graphics 5.25” floppy disk over to the programming dept. and ask for a circle tool. The guys would figure out how to do it, add it to the graphics program, add it to my menu and give it back to me. I would load the floppy, pull up a new screen and low and behold I had a perfect circle tool. WOW! How cool. LOL. The pixels were about the size of a fat ball point pen tip and you could only have 4 colors on the screen at once. They were black, white, blue and orange or the other palette was black, white, green and purple. That was it, no mixing, just those 4 colors. The art was discussed in meetings and I would take notes and try and pick Scott Adams’s brain which was quite vast! He was one of these guys that knows what you're going to say before you say it and already has the answer before you ask it. But in art, it's all in the details, so I always felt weird asking him all these questions about subtle things in the scenes. I would do sketches and show them to him and he would say that's great or suggest changes, but it always worked. Once I nailed the sketch, I would slip it under the clear plastic sheet on the graphics tablet and sketch in the line art and add the colors. As the games started with Marvel, the line art came from the pencil artists at Marvel in the format size we needed and I would do the same process. When a scene was finished, I would take it to the programmers and they would add it to the game. Did you have an opportunity to work with Marvel or other Adventure International artists on the games? I was the only artist on any of the games from the time I started to work there. I don’t know who did the art before me if there was any. I think they were text based with no art. I did go the Marvel comics in NYC with Scott once. I came into work on a Friday morning and Scott said you want to go to Marvel Comics with me this morning. DUH!, YES! It was very cool I got to talk with a few of the pencil artist and see how they did the comics. It was a very enlightening day! You are credited for art on #1 (The Hulk) and #3 (Human Torch & Thing), but no artist is credited on the second game. Were you involved in that game as well? Did you have any involvement on any other Adventure International games? As far as I can remember I did all the graphics on all the games until they closed. I was one of the last guys to get laid off. Can you share any stories or “tidbits” about your time working with Adventure International? When I first started working there, maybe the first week, I didn’t have my own office yet so I was in kind of a common area where all the offices opened up to. So when I was working on a piece of art, everyone would come up behind me and look over my shoulder and suggest things-- like 50 times a day by 50 different people! Jeez! I was going nuts with all the interruptions. So I got everyone into the common area all at once and said, “I don’t need any comments from anyone until the piece is finished and I tell you it’s finished. Then I welcome all your input.” It stopped all the comments from the peanut gallery and then I got my own office the next week and things settled down. It was a great place to work! What have you been up to for the past 30 years? The world’s most awesome “jump the shark” moment. I started my own Graphics Business “McNair Computer Arts” soon after I left there. So I have been working in Photoshop for almost 25 years. I’m a professional Musician, Songwriter, Engineer in Protools. 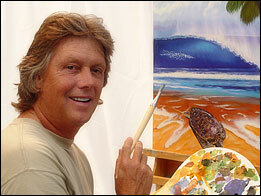 I built thousands of surfboards for many years and had a surf shop in New Smyrna Beach. I got nominated to the East Coast Surfing Hall of Fame this year which is quite an honor. 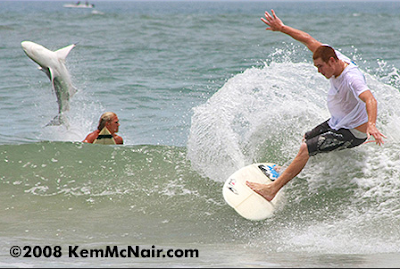 I’ve been surfing over 50 years and won the “East Coast Surfing Championships” a long time ago when I was a kid (1969). I’m a Professional Photographer and got a world famous photo in 2008 of the “famous jumping shark in New Smyrna” which is also the “Shark Bite Capitol of the World”. the photo went totally internet viral and was in over 4000 newspapers and mags and over 45 national TV shows, and that photo is in the 2015 Guinness Book of World Records. You can see it on my website along with some of my art @ www.kemmcnair.com. So with my Art, Music, Surfing, and Photography I rarely get bored. Which is a good thing and I don’t miss the old computer graphics of the 80’s one bit! Thank you to Scott and Kem for answering our questions and for making such fantastic games! 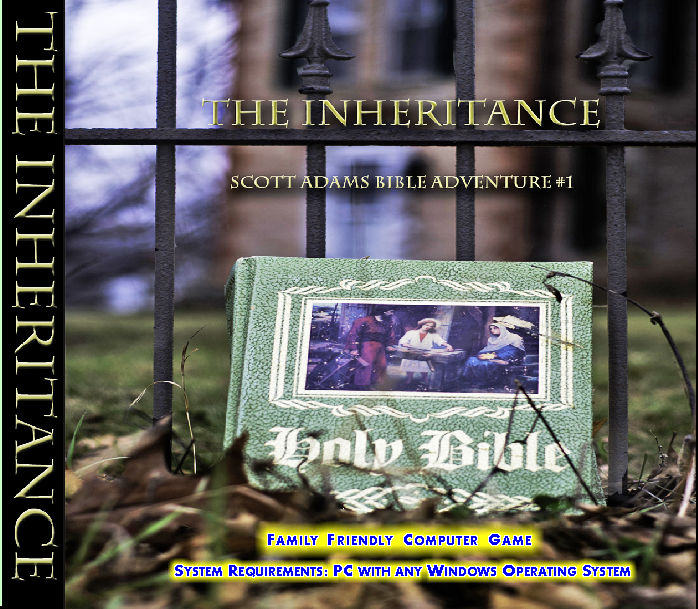 Scott Adams’s most recent game is The Inheritance and you can download a free demo from his website. I (or another writer) will almost certainly be looking at other Scott Adams games as “Missed Classics” in the future; his next game which might make the master playlist is 2000’s Return to Pirate’s Island 2, but as a text adventure it will require the spending of CAPs to get it there. You can follow what Scott is up to on his website. Kem McNair has left gaming behind, but you can browse and buy his art at his website. 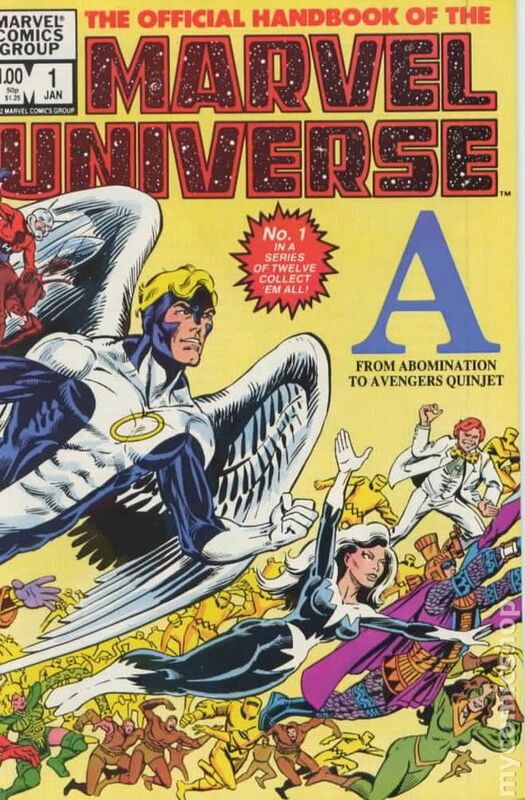 Up next, we will finally conclude our coverage of Questprobe with a look at how Marvel closed out the comic series after the shutdown of Adventure International. WHAT!? I had these books as a kid and I loved EVERY PAGE. Seriously, there is nothing more awesome than a book of super heroes, their powers, and how they stack up with others. By the 90s, this book series was replaced by collectible trading cards of heroes and that wasn't quite as good to me, though I suspect still pretty nice. This is how you can know (for example) just how much stronger the Hulk is than the Thing. It provides a sense of consistent reality to the books, as well as introducing characters that you might never have encountered on your own. I think I read one of these too. It even says how much of the healing factor and speed were being hindered by all the Adamantium injected into Wolverine. It even goes to say that Vibranium is possibly the only metallic non-magical material substance that is strong enough to withstand Wolverine's Adamantium claws. Sorry if it's somewhat unrelated to this post, but I've just seen that GOG.com has a huge Activision cheap bundle for the week-end, including a lot of games like Police Quest, Phantasmagoria, Zork and so forth... Worth take a look!